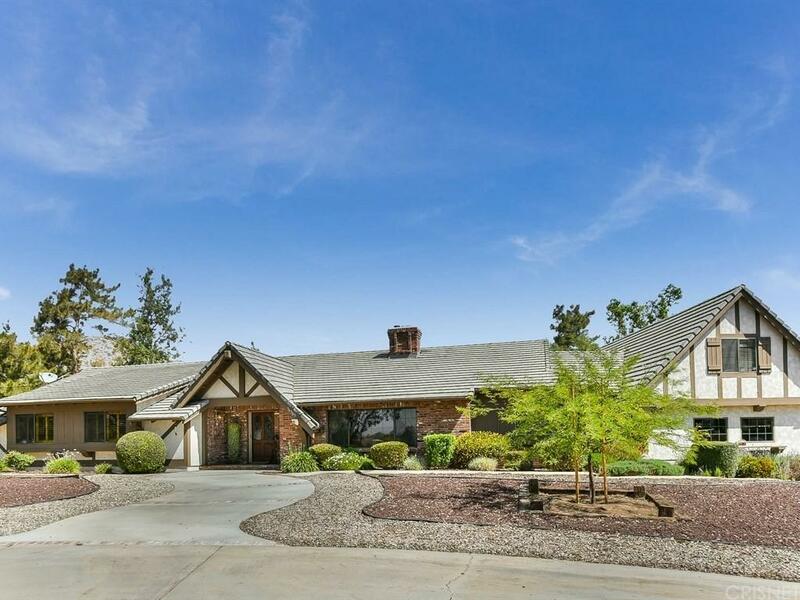 Sprawling single story, ranch home sits on almost two acres of all useable land. Recently desert scaped with red rock front yard and 1731 sq. ft. of premium, easy maintenance, artificial turf in the backyard. Entire interior of home has a lovely, hand trowel plaster finish. This 4 + 3 with additional mother-in-law quarters, welcomes you from the moment you walk in. Step down living room outlined by rough sawn lumber and corbels. A warm and cozy, red brick floor to ceiling fireplace invites you to stay. Wood floored dining room peeks at the view through sparkling diamond leaded stained glass windows with oak wood sills. Open kitchen, family room floor plan. Kitchen newly remodeled with updated granite counter tops, stove top, & wood like tile flooring throughout. New masterbath updates are stunning! Additionally property has RV parking and horse facilities. Including a 3-stall barn with 12' x 12' box stalls opening to 24' x 18' in-outs. There are mirrored spaces, all 12' x 12' across the breezeway from the stalls for the feed room. There is a fully enclosed and lockable tack room and a storage/tractor space. If desired these could be converted into additional box stall space.